3D printing offers some phenomenal opportunities to advance medical care, and not just for humans. At Auburn University College of Veterinary Medicine, doctors are using a MakerBot 3D printer to make delicate doggie surgery possible. The 3D-printed bones on the left in the image above are an exact replica of the injured vertebrae that made walking difficult for Sophi, a 7-year-old Yorkshire terrier. The bones had slipped, pinching Sophi's spinal cord, but screwing metal plates to the 3-pound pup's tiny spine without hitting delicate nerves would be too difficult without a practice run. So Drs. Don Sorjonen and Adrien-Maxence Hespel printed a precise model of Sophi's vertebrae that helped them plan exactly how to mend her injury. Traditionally, doctors can only select the hardware and figure out how to attach it once surgery is under way, a process Dr. Sorjonen says can take about 45 minutes. More importantly, the practice model gave the doctors the confidence to know what to expect from the procedure. "I don't think we could have done this without the 3D model, honestly," Dr. Sorjonen said. 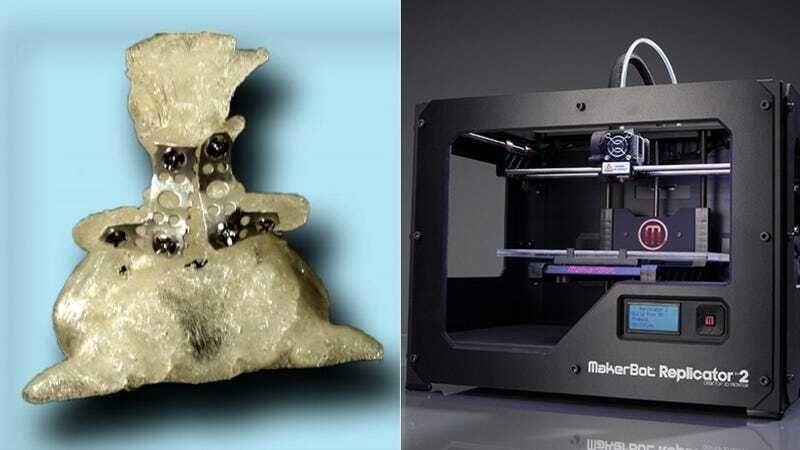 It's just the latest in an exciting and ever-expanding field of 3D printed medical solutions. Last month, surgeons in the UK made facial bones for a badly injured cyclist, printing titanium implants and guides and practicing the delicate procedure with virtual modeling. Earlier this year, doctors in Japan used a 3D printed model to determine how to fit an adult's donated liver into a small child recipient. And at the University of Florida, models printed from MRI and CT scans give neurosurgeons a realistic way to practice delicate brain surgery.